I first met Horseradish in junior high school. One of the classes I was taking put together a traditional Jewish Seder feast as one of our assignments and we were each assigned to bring one of the elements of the feast to the class so we could all learn more about what happens during a Seder. I’m not Jewish, so the whole experience was new to me then and I found it all quite fascinating. One of the dishes that is still most memorable to me from that day was the prepared Horseradish. 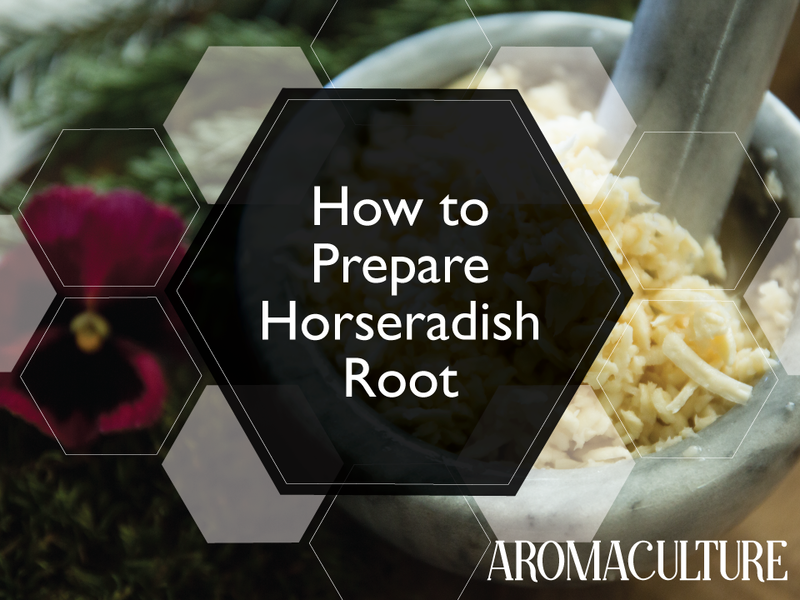 I now use Horseradish in a variety of herbal recipes, including a traditional Fire Cider, but sometimes I like to prepare it on its own so I can use it in other dishes. Tip: Horseradish is rich in volatile oils that aren’t altogether pleasant (they’ll burn your nose if you accidentally stand over the Horseradish and inhale it after grating it), so it’s a good idea to prepare Horseradish with a window open. The longer you wait to add the vinegar to the recipe after grating the Horseradish, the stronger and sharper its taste (and aroma) will be. To prepare Horseradish, peel one fresh root and grate or chop it into more manageable pieces. You can then use a food processor or blender (or a mortar and pestle) to puree the Horseradish. Add 3 tablespoons of raw apple cider vinegar to each cup of Horseradish, along with about half a teaspoon of sea salt. Continue to puree until all of the ingredients are thoroughly incorporated. Store the finished Horseradish recipe in an airtight container in the fridge where it should keep for at least one month. I like to add it to smashed potatoes and roasted vegetables, but you could also use it in sour cream as a flavorful dip for fresh veggies. The Cherokee peoples have traditionally used Horseradish as an antirheumatic and diuretic, as a remedy for colds and to improve digestion. It is used in many herbal traditions as a catalyst herb, much the way Cayenne would be used, and is stimulating and energy-moving. When you first taste it, you might think it is a bit strong and possibly even off-putting, but you’ll probably find that it grows on you pretty quickly. I know it has for me! How do you like to enjoy Horseradish?